Welcome to our Friday Hack! 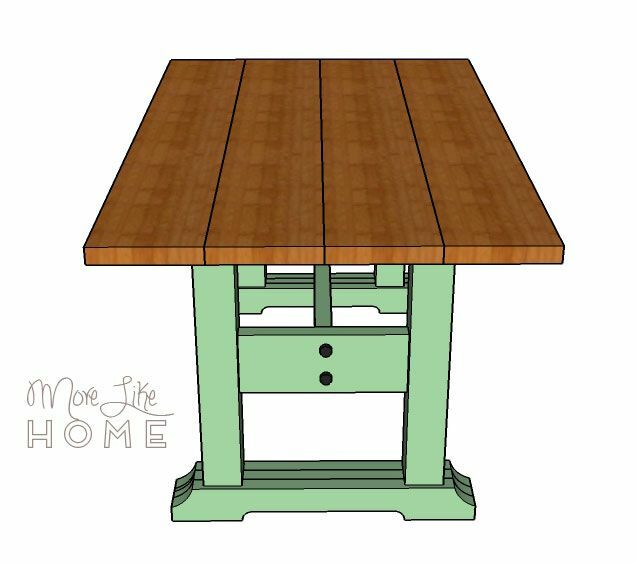 Today we're tackling a beautiful little farmhouse style dining table. I found this in an issue of Better Homes & Gardens and fell in love with it. The style is simple without being boring, and the bright two-tone finish makes it cute, welcoming, and full of charm. 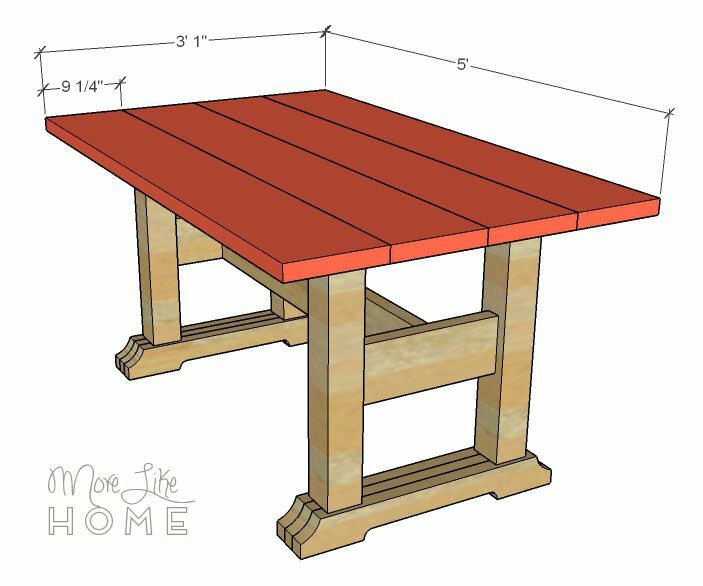 It's the perfect little table for your family to come home to at night! 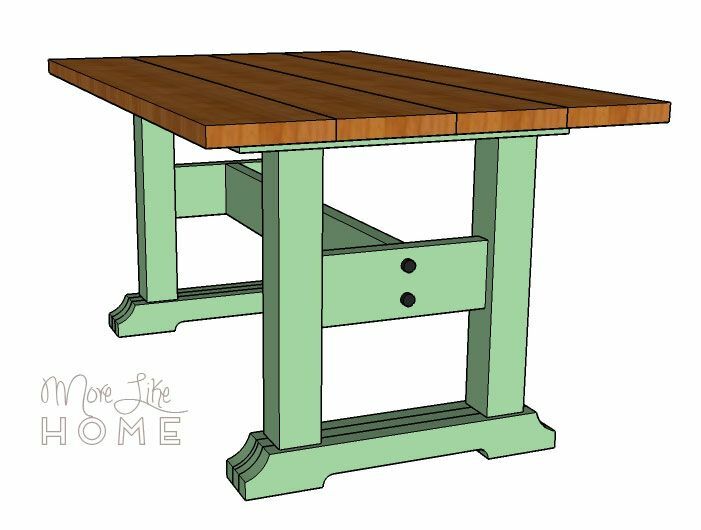 I'm calling it the Friendly Family table because the finish of the original is so bright and friendly. It's the kind of table that will welcome your guests in and invite them to stay. It's relaxed and comfortable so everyone can feel right at home. And what a perfect table for the center of life with your own family! 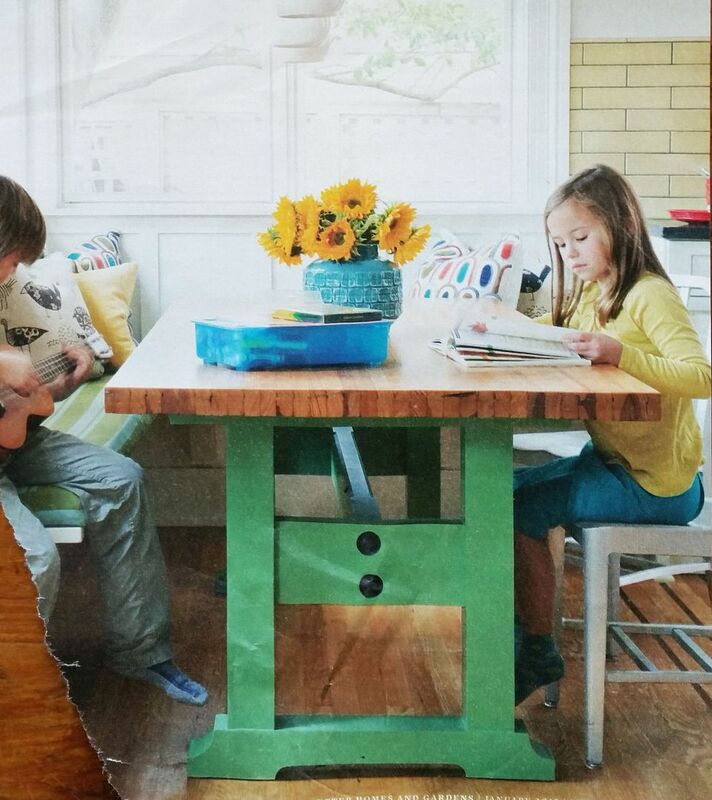 The big work surface is great for homework, crafts, coloring, and of course dinner together. But enough chit chat, let's get started! Read all the steps before beginning (and the notes on making the tabletop). Work on a level surface. Cut your pieces as you go, double checking measurements before each cut. Pre-drill and countersink your holes, and always use glue. Use necessary safety precautions, and don't forget to have fun! Finished dimensions are 60" long x 37" wide x 30" tall. 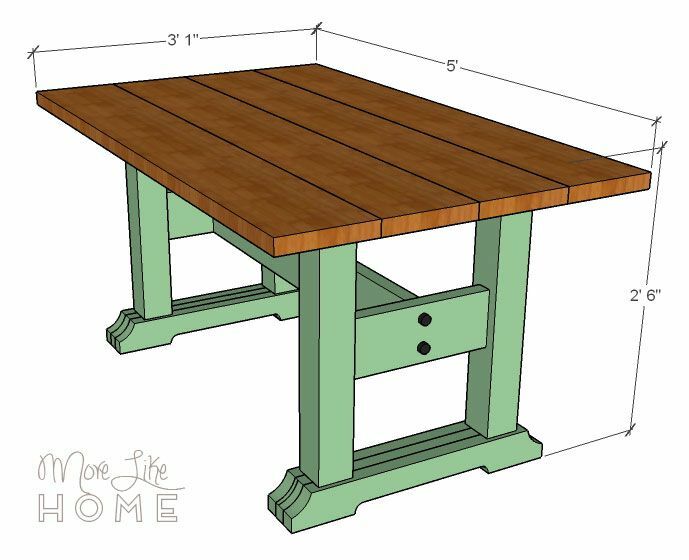 You can easily adjust the length by changing the length of your table top & stretcher. Start by connecting two legs (A) with a side stretcher (B). Work on a level surface to make sure your legs are straight and even. 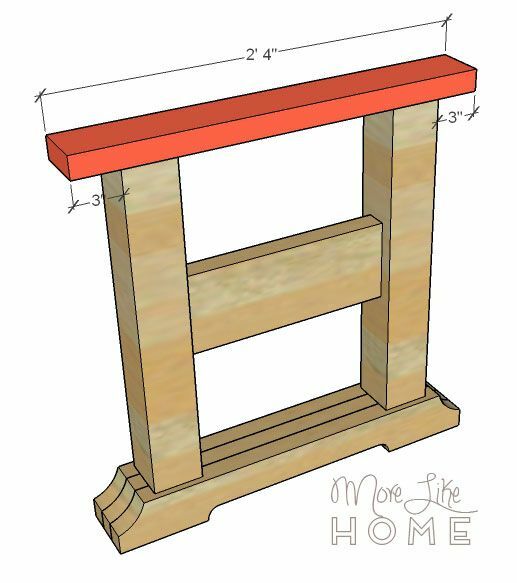 The side stretcher should be set up 9.25" from the base of the legs, and roughly centered across the width of the legs. The easiest way to attach it would be with the Kreg Jig & 2.5" Kreg screws, but in a pinch you could drill through the legs into the ends of the stretcher if you can find long enough screws (4.5" long). Next notch out all the base pieces (C). On the first piece, measure in 2" from each the top corner and make a mark. Then measure 2" down from each top corner and make a mark. Draw a curved line (or use a bowl as a template) connecting the two lines at each corner. Cut along the lines with a jigsaw. 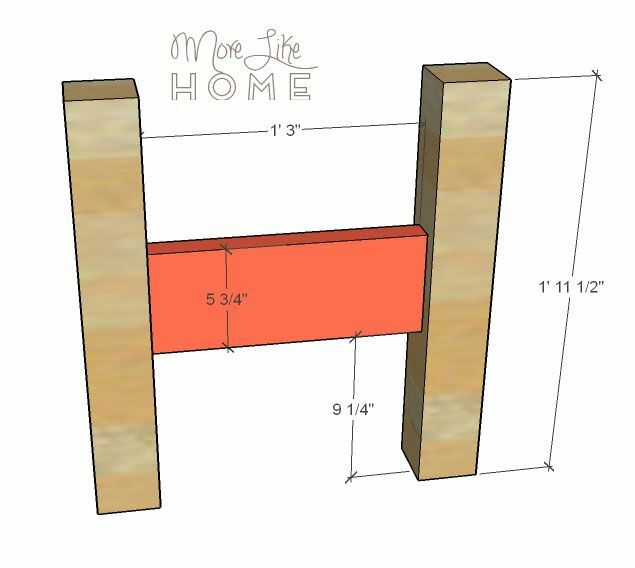 For the bottom notch, measure in 6.5" from each edge and make a mark. The 15" space between these marks will be the notch. Draw a line 1" above the bottom edge between the marks, and round the corners at the ends. Cut along the lines with a jigsaw. Use this first board as a template and trace your notches on the remaining five base boards. One you have them all cut out, attach three boards together side-by-side using 2.5" screws and wood glue. Start by drilling through the center board into the outside board, then through the inside board into the center board (this will put the only visible screws on the inside of the base with none on the outside). You'll probably need to use a sander to smooth out any unevenness between the notches. Repeat with the remaining three boards to create the other base. 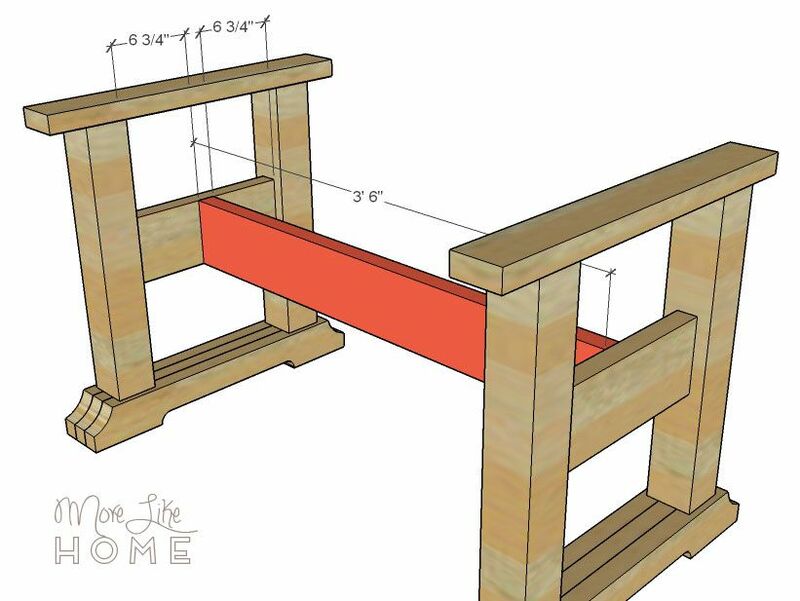 Attach one base to the leg section you built. 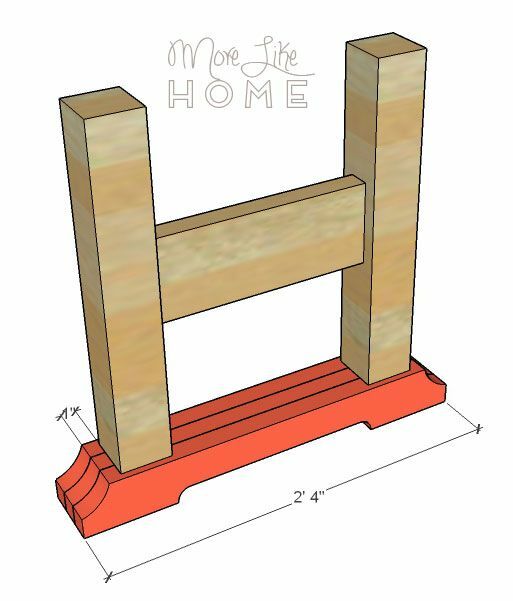 You can use a Kreg Jig with pocket holes ( I would do pocket holes on two sides of the leg since they are so thick), or drill up through the base into the bottom of the legs with 4.5" screws. Attach the top support (D) across the top of each leg section. It should overhang 3" on each side. Drill down through the support board into the top of the legs with 2.5" screws (put two into each leg). Repeat this process to build the second leg section. Connect the two leg sections together with the center stretcher (E). Center it on the side stretchers with 6.75" of space on either side. 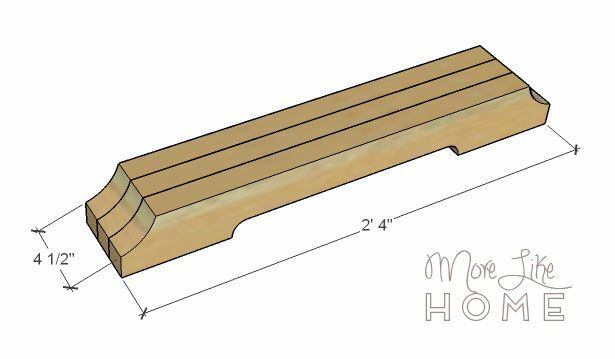 You can attach it with a Kreg Jig, drill through the side stretcher into the ends of the center stretcher with 2.5" screws, or get the look of the inspiration photo by using large bolts through the side stretchers, into the ends of the center stretcher. I prefer a wider plank look for the top, but you can switch out the 1x10's for a different size if you prefer! If you like the super narrow boards of the original table you could try 1x2's turned on their side, but you might need to run them through a table saw first to take off any rounded corners so you don't have a bunch of crevices to clean out after you eat. Fill any holes with wood filler, then sand everything smooth. Start with a rough paper and work your way to a finer paper. Don't skimp on the sanding, it really makes a difference in how professional your finished project looks! Then finish it with any paint or stain and polyurethane you like! 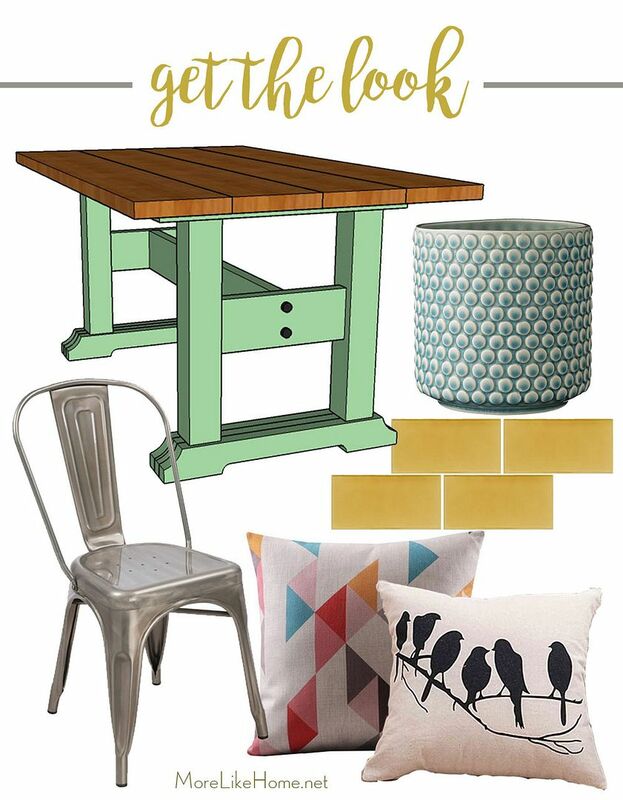 For the inspirations photo look, try a stained and polyurethaned top with the base painted a sea foam green. If you love the style of the eat-in kitchen in the inspiration photo, you can get a similar look with a few great accent pieces! 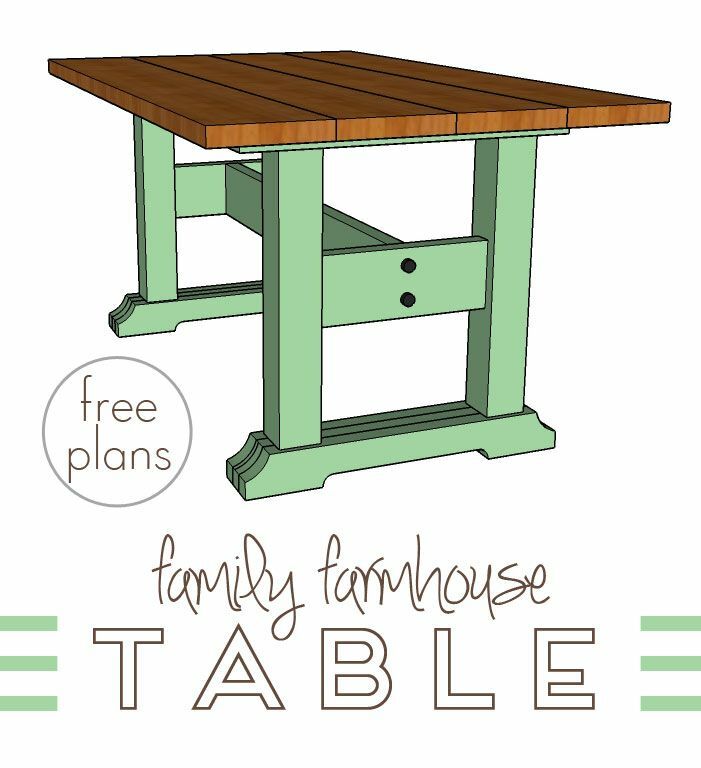 Start with you new Friendly Family Farmhouse Table, of course, and then a built-in bench is a great addition if you have the space. Add few aluminum dining chairs along the other side. Throw pillows are one of the easiest ways to add color and personality to a space (and especially great if you have bench seating). Try mixing bright geometric pillows with a more organic bird silhouette pillow. A ceramic flower pot or vase with some bright blooms is a perfect centerpiece to keep the space feeling warm and fresh. And finally if you're working on an eat-in kitchen, I love the yellow subway tile backsplash that extends right up to the dining area and creates a beautiful accent for the dining space (if you're working in a dining room, yellow curtains could also do the trick). That's it for this Friday Hack! What are you working on this weekend? What about hanging a basket off the leg support cross pieces for supplies when you want to shut at thus table to work, such as pencil, pen, note pad, calculator, and Post It notes?